In September I went to one of the most fascinating cities anywhere in the world, Matera. Deep in the heart of the mezzogiorno in the south of Italy, Basilicata’s Matera is one of the world’s oldest continuously inhabited cities. It is sensational, awe inspiring and completely compelling. There is so much to see and do in Matera it becomes impossible to try and fit everything in. One thing we weren’t able to do on this trip was visit the ghost town of Craco, which is not far from Matera, in the Gulf of Taranto. I’m going to make sure I get there next time I’m in the deep south, and will be able to write my own story and post my own photos, but in the meantime I wanted to share this blogpost from AncientOrigins.net, written by Bryan Hill. I’ve had it in my research folder for ages but it’s too good to not share! 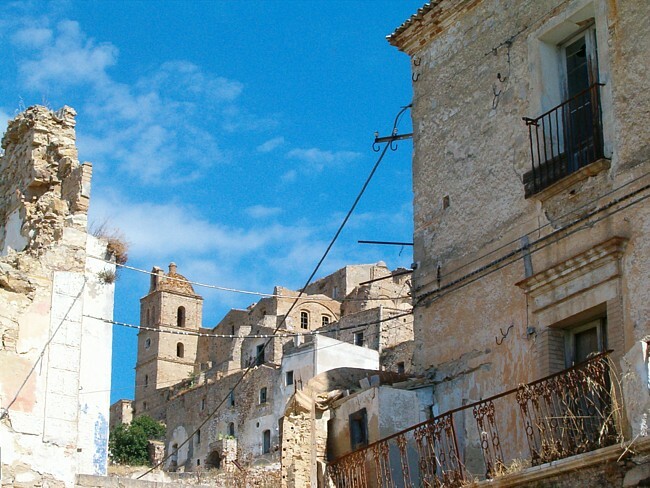 For nearly fifty years, the town of Craco in southern Italy has stood uninhabited. Here, dark windows look out at potential travelers like empty eye sockets and the streets and buildings of this medieval town seems to have literally been vacated overnight, left to crumble in decay. Craco was once a monastic center, a feudal town and center of education with a university, castle, church, and plazas. Today, thanks to the dramatic landscape and unique atmosphere, Craco has been the set of many movies including Saving Grace, James Bond Quantum of Solace and the hanging of Judas scene in Mel Gibson’s the Passion of the Christ. 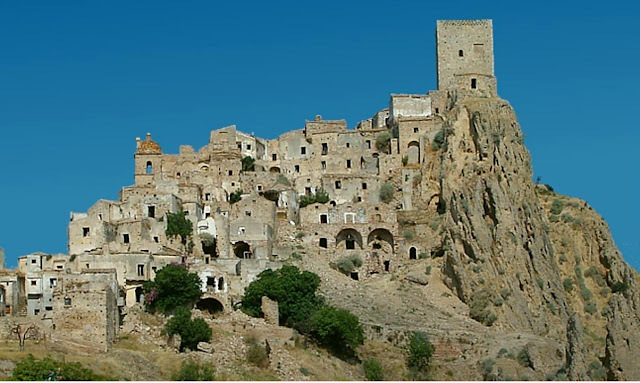 Craco is a former medieval village located in the earthquake-prone Basilicata region of Italy, about 40 km (27 miles) inland from the Gulf of Taranto at the instep of the “boot” of Italy. The settlement occupies a rock formation above the surrounding hills with its architecture neatly built into the landscape. Perched strategically on top of a 400 meter (1,300 ft) high cliff, overlooking the arid countryside of southern Italy, this ghost town once provided panoramic views and warnings of potential attackers. The city was founded around 540 AD by Greeks who had moved inland from the coast of Basilicata. Back then Craco was called “Montedoro”. Tombs have been found here dating to the 8th century, which suggests that the original settlement dates back to the Iron age. The first written account mentioning Craco dates back to 1060 AD, when the land was owned by Archbishop Arnaldo, Bishop of Tricarico. He called the area “GRACHIUM” which means “from the little plowed field.” The oldest building of Craco, the Norman Tower, was built in 1040 and many of Craco’s buildings date back to medieval times. From 1154 to 1168, the control of the village passed to “Eberto”, who established the first feudal control over the town. In 1179, Roberto di Pietrapertos became the ruler of Craco and in 1276 a university was established. It was during this period, that the landmark Castle Tower was built under the direction of Attendolo Sforza, and in 1293 under Federico II, it became a prison. By the 15th century, four large plazas had developed in the town including the Palazzo Maronna, Palazzo Grossi, Palazzo Carbone and Palazzo Simonetti. The population of Craco grew from 450 in 1277 to 2,590 in 1561, and averaged around 1,500 in succeeding centuries. The construction of the Monastery of St Peter in 1630 helped established a permanent monastic order. In an agricultural community built largely on the production of grain, oil, vegetables, wine and cotton, the monastery helped drive the economy through the introduction of science and religion. However, in 1656 a plague struck Craco, killing hundreds and reducing the population significantly. Towards the end of the 19th century, the city reached its maximum expansion limits. A severe famine due to poor agricultural conditions caused a mass migration of Craco’s population, about 1,300 inhabitants, to North America between the years 1892 and 1922. Since Craco was built on a hill, composed of clay-rich soil of various types of red, green and dark grey clay, with different levels of drainage the terrain was highly unstable. This caused Craco to be affected by many landslides of natural origin, in 1600, 1805, 1857, and 1933. Surviving for over a thousand years, the town survived the plagues and its share of thieves and bandits, but finally succumbed to natural disaster when landslides occurred during the 1950s up through the early 1970s. Despite the precarious living conditions, many of the “Crachesi” (inhabitants of Craco) were still very much attached to their beautiful medieval town and refused to leave. In the 1950’s, the soil conditions of the town deteriorated further, causing more landslides and making the town and the buildings dangerous to live in. Periodic earthquakes were a secondary cause of destruction. 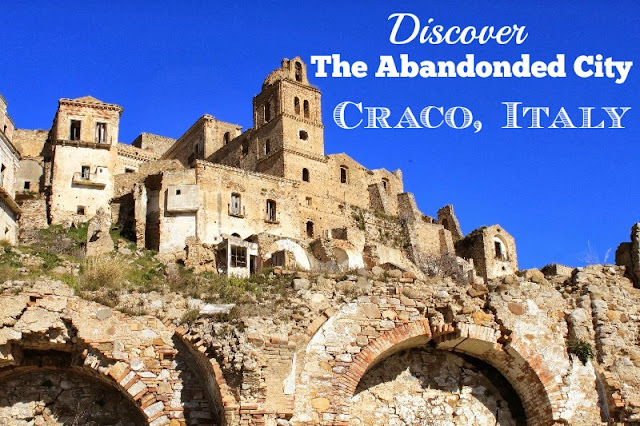 In 1963, the last 1,800 residents were forced to leave Craco for their own safety and were relocated to Craco Peschiera, a new town in the valley below just a few kilometers away. For years, the displaced citizens were forced to live in tent cities and barracks as the government struggled to create housing options for the afflicted. Craco’s medieval churches remain a focal point of the settlement and six religious festivals are held at the city each year between May and October. There is a small church which houses the religious relics of the mummified body of St. Vincenzo, the martyred patron saint of the town. San Vincenzo was a soldier in the Legion of Tebea, the army of General Massimiliano in 286 AD who was martyred because he refused to renounce Christianity and worship the Emperor Marco Aurelio. His relic was brought to the town on June 4th, 1792, and moved to the new church after the old town collapsed. 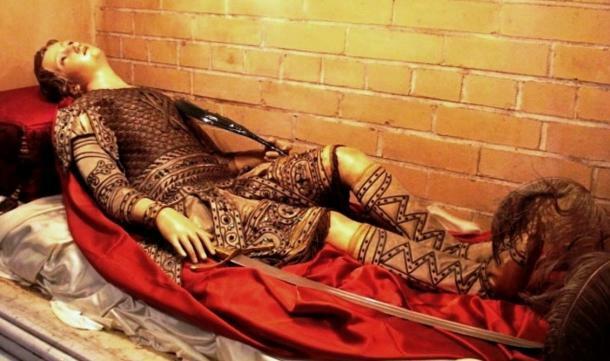 Inside the casket is the waxen body of the martyr, dressed as a Roman soldier and lying in a reclining position. 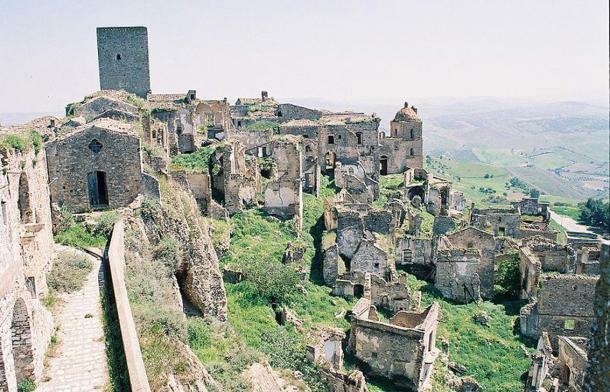 Today, Craco has been abandoned, plundered, overgrown and is no longer accessible to the public, except by guided tour. While the town has fallen into ruin, several of the buildings, palaces and churches still remain intact with original features like shutters, railings, and frescoes serving as a reminder of the life that once existed within the walls. Other than that, the village receives visits from travelers and the occasional film production. Like other ghost towns covering the Italian countryside, Craco is now the focus of conservation efforts. In 2010, it was added to the Watch List by the World Monuments Fund. As tourism has increased, the local municipality has also secured both EU and regional funding, which brings in concerts, festivals and cultural events as well as funds that help to maintain the site.